Whether you are undertaking minor chores at home or working on a construction site, one thing is for sure – you need to protect your eyes at all times. As you can imagine, a pair of safety glasses makes this a lot easier for you to manage. The trouble, of course, is finding one that is actually up to the task. See, the best safety glasses need to be made from strong, resistant material, offer up a good fit, and be comfortable to wear for extended periods of time. Since the hunt for the perfect pair can get rather tedious, we decided to handle the heavy lifting for you. Here, you will find the safety glasses that we found to be most protective and useful. We also threw in a buyer’s guide to make your search just a little bit easier. The Gateway Safety glasses prove that safety doesn’t have to be boring. Although the lenses themselves are clear, the arms are available in different bright colors. This is one of the reasons that these glasses are a great option for kids. The other, of course, is that they are available in small and regular sizes. It should be noted that these glasses will fit most kids and average side adults if you have a larger head, they may prove to be a tight fit. The other perk with these glasses is that they are incredibly lightweight. Despite this, they are still made from a durable material that is scratch-resistant, ensuring that it will last longer. You can also wear these glasses outdoors as they are equipped with UV protection and will work well to safeguard your eyes against harmful rays. It should also be noted that these glasses have undergone various testing and have met ANSI Z87.1+ and Mil-prf-31013 specifications. Essentially this means that they really do help to protect your eyes. Another great feature on these safety glasses is the fit. Not only do they wrap around your head well, they also cover well above and below your eyes for ultimate protection. Gateway Safety, Inc - Misc. The JORESTECH safety glasses work well for a number of environments. So, whether you are a construction worker or a dentist, this pair of glasses will work well for you. Now, while there is only one size, it does work well for most children and adults. One of the best parts about these glasses are the lenses. They are made from polycarbonate material which makes them impact resistant. So, even there is debris flying towards your eye or you drop the glasses on the flow, you can be quite certain that they will not be damaged. What’s more, they also have a tough, scratch-resistant coating which also helps to improve the overall durability of the glasses. These glasses are also safe to wear outdoors as they offer UV 400 protection from dangerous UVA and UVB rays. To top it off the glasses boast an ANSI Z87+ certification ensuring that you can trust the quality that you buy. To add to the quality and comfort of this glasses, it has a hi-flex frame. This affords you a much more customized fit, guaranteeing that the glasses will not slip. The design also makes the glasses easy to wear for long periods of time. The only real flaw of the design of this safety glasses is that they sit rather close to your face, increasing the chances of the lenses fogging up sometimes. If you are looking for safety glasses to exclusively use outside, then this Jackson pair will be a great option for you. 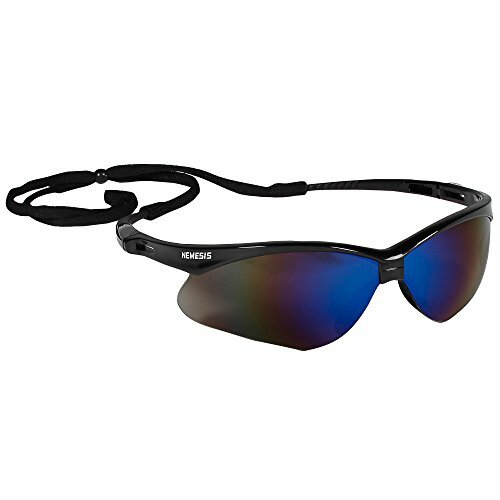 The smoke tint and the outer blue mirror finish both help to keep the sun out of your eyes, even on very bright days. To top it off, these glasses also work well against all types of UV rays, protecting your eyes even further. You should know, however, that on gloomier days, these glasses may prove to be a little too dark for you to use as safety glasses. Since the lenses are made from polycarbonate material, they happen to be rather durable. They also meet ANSI Z87.1+2010 standards for protection. That being said, these glasses may not be suitable for heavy duty construction work, though. There is no denying that these safety glasses have been designed quite well. For one thing, they are anti-fog so you don’t have to worry about wearing them in all kinds of temperatures. Furthermore, the wrap-around arms ensure that the glasses are fitted snugly against your head, allowing to move about with ease while wearing them. Also, the customized nose piece prevents the glasses from slipping down your nose and even helps to keep sweat off of your face. As the name insinuates, these glasses are built to protect your eyes from debris both big and small, regardless of what it is that you are doing. The glasses are able to live up to their promise largely because they are composed of polycarbonate material. This makes them well-suited to shield your eyes from most objects. Despite being untinted, the lenses have a double coating. Due to this, they have anti-fogging properties and provide glare protection as well. The lenses also offer UV protection, keep your eyes shielded from harmful rays. Thanks to these features, you can be certain that you will be treated to a clear, unvarnished vision at all times. The only real disadvantage with these glasses, though, is that they aren’t nearly as scratch resistant as they claim to be. So, while they will protect your eyes, there is a chance that they may get damaged while doing so. However, what these glasses do get right, though, is the excellent fit. Since most of the features on the glasses are adjustable, you get a much more customized fit. For instance, you can adjust the nose piece, temple angle, and temple length. This means that regardless of the shape and size of your face, you will feel comfortable wearing these glasses. If you want to engage in some serious construction or renovation work, then these are the glasses for you, although they really are more like goggles. Now, the lenses are made from a very durable polycarbonate material which makes them highly impact resistant. Not only does mean that they are better equipped to protect your eyes, it also ensures that they are largely impervious to falls. The lenses are also designed to meet ANSI Z87.1+ standards, guaranteeing that they are well-suited to keep your eyes safe. The lenses have also been treated to be UV-resistant, making these an excellent pair of glasses to wear when working outside. Another reason why these glasses are so good at shielding your eyes is because of the dual injected rubber that sits around the lenses. This creates a type of vacuum, making certain that even smaller particles of dust, dirt, or debris are kept away from your eyes. You will also find that the safety glasses easily fit your face and head thanks to the adjustable, elastic cloth trap. Now, though the manufacturer has gone to certain lengths to include ventilation channels on either side of the mask, it is still not very suitable for very hot or humid conditions as it can cause fogging. In this section, we will go through all of the information that you need to be aware of if you are hoping to find the best possible safety glasses for yourself. There are really two types of safety glasses available on the market. These are the glasses with side shields and the ones without. As the name suggests, the glasses with the side shields have protective material that covers the side of your face. The non-side shield variety does not have this feature. You can rely on the non-side shield glasses if you aren’t doing anything involving construction, large pieces of debris, or using heavy machinery. If you just want to protect your eyes from dust particles or smoke, then these are the safety glasses for you. On the other hand, if you are planning on engaging activities with a higher level of risk, you will certainly need the side shield on your glasses. 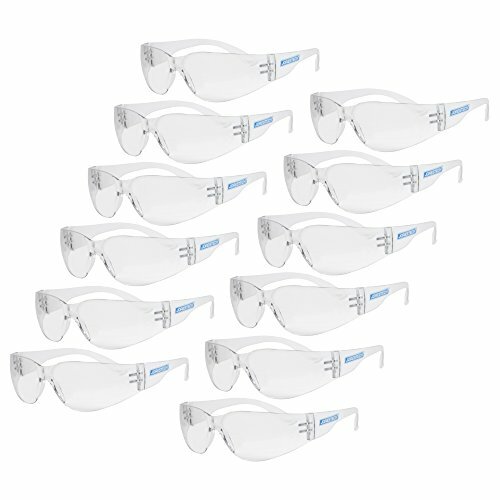 Most of the safety glasses that you will come across are made from polycarbonate material. This is because it is a nice compromise between price and durability. The main reason that polycarbonate lenses are utilized is due to its impact resistance. This means that when debris or other particles make contact with the lenses, they are unlikely to break. So, they are much more capable of protecting your eyes in hazardous conditions. This material also increases the chances of your safety glasses lasting longer. The other reason that this material is so popular is because it typically provides protection from UV rays as well. This is without the need for any other coatings or layers. As a layperson, it can be difficult to determine if the pair of safety glasses that you are buying really is able to protect your eyes properly. This is why looking for the ANSI Z87.1+ certification can be useful. If a pair of safety glasses has received this stamp of approval, you can be quite certain that it has met certain industry standards. It is especially important to look for this standard if you want a pair of glasses that are suitable for heavy-duty construction work. As mentioned, by itself polycarbonate lenses provide you with UV protection. However, they don’t work too well against glare. So, if you are going to be working in sunny conditions, then look for a tinted pair of glasses as these will help to ward off the glare. The only downside to these that in gloomier conditions, the lenses can be too dark. In case you don’t want to keep swapping out your safety glasses, you can look for ones with photochromic lenses. These react to the light levels in any given environment, darkening or lightening to suit them. Then there are the special coatings. These are used on lenses to prevent them from fogging up when working in hot or humid conditions. Thus, if you tend to work in such temperatures, it can be helpful to get a pair of safety glasses that have been specifically treated with anti-fogging properties. The other type of coating is scratch-resistant. These work to prevent the lenses from being damaged in any way, should there be debris scraped against it. This feature is great if you want to extend the lifespan of your safety glasses, without constantly having to buy new ones. Now, regardless of whether the lenses have been treated with tints or coats, there is one thing that is imperative – you should be able to clearly see through your lens. This means that the lenses have to be clean and offer you an unobstructed view. At the same time, there should be no distortion or fish-eye lens type feature either. Keep in mind, when you are working with tools or doing something detail-oriented, you will need perfect vision. Last but not least, you will need to make sure that the safety glasses fit well on your face and around your head. This will prevent the glasses from shifting about and will also ensure that you are comfortable. There are several points on your face and head that the glasses should rest properly on. The first point should be the bridge of your nose. The space between the lenses should accommodate a wide variety of nose widths while preventing indentations or marks of any kind. The lenses should also cover the upper portions and the lower parts of the eye region so that entire area is well-protected. The arms of the safety glasses should rest comfortably on your ears and should then wrap around the sides of your scalp for a snug fit. You should follow these tips to be certain that you are making the right decisions regarding safety glasses. If you wear prescription glasses, you should look for safety glasses with enough space between your eyes and the lenses. This way, there will be room for you to wear your glasses behind them. The other thing that you should be aware of is the weight. 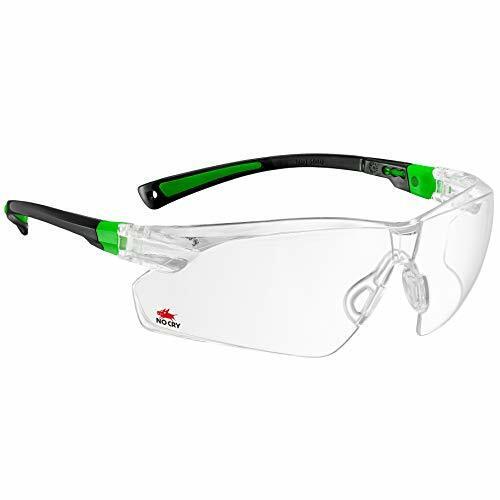 If you have to wear your safety glasses for a long period of time, then it is best to stick with lightweight options as these are more comfortable. Finally, if you have a tendency to perspire quite a bit, it can be helpful to wear safety glasses with lots of ventilation. This can cut down on the risks of the lenses becoming fogged up. To wrap things up, remember that the best safety glasses are durable, offer different kinds of protection, and must be comfortable to wear. 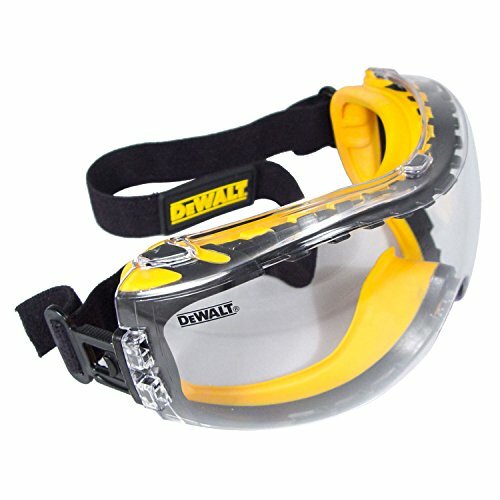 If you want a pair of safety glasses that can be used in risky construction conditions, then you will find the DEWALT model to be the best. On the other hand, if you are just looking for something to use around the house, then Jackson Safety and NoCry glasses will be just right for you. 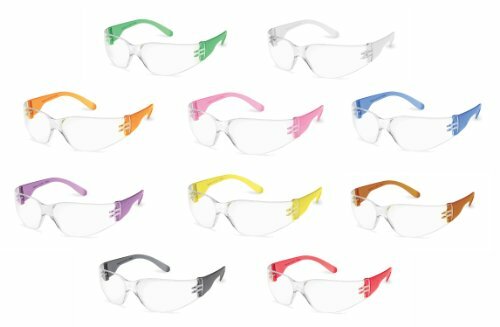 In case you want safety glasses that will fit a wider number of individuals, you should consider the JORESTECH and Gateway Safety glasses. So, there it is, all that you need to know about choosing the best safety glasses for yourself. These reviews and guide should make your job a lot easier now.